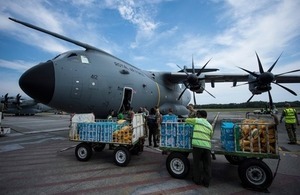 A RAF aircraft will help deliver up to 20 tonnes of UK aid supplies to those affected by the devastating cyclone that has struck Mozambique, Zimbabwe and Malawi, the Defence Secretary Gavin Williamson announced today (Sunday, 24 March 2019). The A400M Atlas aircraft will help provide critical humanitarian aid from the Department for International Development (DFID) for survivors of Cyclone Idai in Mozambique. The Government of Mozambique has declared a national emergency in the aftermath of the cyclone and the arrival of the aircraft next week will ensure UK aid can be used to meet immediate needs on the ground. The A400M Atlas previously delivered 17.5 tonnes of UK aid relief to those affected by the earthquake and tsunami that struck Indonesia last year. The UK stands united with those affected by the devastation of Cyclone Idai at this incredibly difficult time. Our partners across the globe can count on our Armed Forces to lend a helping hand in times of need, which is why are sending an RAF aircraft to assist with the aid relief. The deadly cyclone and torrential rains may have left more than a thousand people dead in Mozambique alone and it is one of the biggest humanitarian disasters the region has ever faced. It is estimated by the UN that 350,000 people are still at risk due to rising water levels in urban and rural areas. UK aid on board the aircraft will help towards providing vital relief for the 37,500 people in need of urgent shelter. Current reports indicate at least 17,400 homes have been completely destroyed by the cyclone and flooding and the RAF’s rapid deployment of the aircraft will help ensure the timely delivery of UK aid supplies. RAF pilots will use their training and expertise to safely navigate through challenging flying conditions and deliver UK aid to those who need it most. Many villages and landmarks have been submerged by floodwater, stalling all land-based rescue missions and making the delivery of aid by air even more critical. The content of the UK aid package on board is still to be determined, but is expected to include relief items such as solar lanterns, water purifiers and shelter kits. The UK government was one of the first to respond to this crisis and is currently the biggest global donor to the response. It is doing all it can to provide life-saving help to the hundreds of thousands of people left homeless or without food by this devastating cyclone. The UK aid on board this RAF plane due to fly into Mozambique contains essential supplies, which will made a real and immediate difference to the survivors. This is undoubtedly one of the biggest natural disasters to hit the region, and our thoughts remain firmly with the victims. A DFID flight containing over 7,500 emergency shelter kits and family tents arrived in Maputo, Mozambique’s capital on Wednesday last week. Another UK aid flight is due to leave Doncaster today carrying forklift trucks and other cargo handling equipment. This will speed up the time it takes to unload aid from planes, ensuring it reaches the survivors of the cyclone more quickly. DFID experts are already on the ground coordinating the response. A UK aid chartered plane is also currently doing shuttle runs, carrying aid between Maputo, the capital of Mozambique, and Beira, a city in the area worst hit by the cyclone. In addition to relief supplies prepositioned in Mozambique before the crisis, DFID has also supported the World Food Programme to deliver airdrops of high-energy biscuits to isolated pockets of people stranded by floodwaters in Beira. The UK’s total support for the survivors of Cyclone Idai now stands at £22 million. This includes £4 million of aid match money for the Disasters Emergency Committee’s appeal.